Every time I visit the Toronto Public Library I manage to get something new in the graphic novel genre. Last week I picked up Osamu Tezuka’s MW and Rutu Modan’s Exit Wounds. 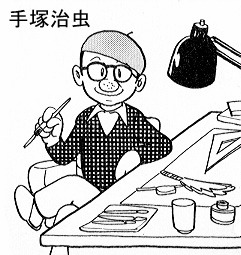 I had no prior knowledge of the enormous reputation that Tezuka enjoys. He’s known as the father of Manga. Tezuka’s MW is a gothic novel, extremely disturbing because it portrays extreme evil. It’s been a long time since I encountered a character that is so completely evil in a work of fiction. Somehow the notion of evil in fiction seems rather antedulivian if not completely anachronistic. And while the graphics were fantastic, somehow I didn’t quite enjoy the book. I mean, homosexual Catholic priests may have been shocking in the 1970s (actually not even then), but seem so passé now. But it would be inappropriate for me to judge Tezuka based on reading just one book. My interest in Exit Wounds was heightened because it’s based in Tel Aviv. 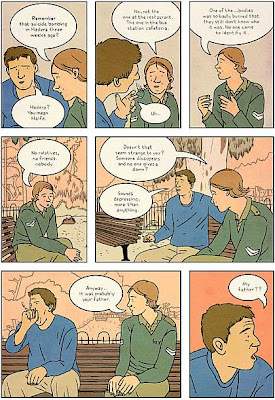 Modan’s an Israeli graphic novelist. Modan’s Exit Wounds is an evocative book. The drawing is simple – reminds one of a Tintin comic book. The storyline is simple, and the characters are contemporary and believable, except perhaps the cab driver’s father. My only problem with that character is not that he’s hidden from the reader even after the story ends, but with his inexplicable and at time completely unnecessary dalliances, and then his equally sudden and inexplicable marriage to a deeply religious woman. I feel kind of sorry that I’ve been introduced to the graphic novel so late. Actually, I knew of its existence through (and I’ve said this before) the Lounge – the weekend edition of Mint. However, I never really got down to reading a graphic novel because I always thought that they weren’t anything more than a glorified version of a comic book; which they are and aren’t. The other reason was that in Mumbai I wasn’t an active member of any library for the last decade or so – although I doubt if any of the libraries would have graphic novels. Yes, I bought books in Mumbai regularly, but these were non-fiction. The transformation after immigrating to Toronto is that I’ve gone back to borrowing books and reading fiction actively. I can’t afford to buy books right now and besides the Toronto public library, there are so many people more than willing to lend books. I’ve got to finish Ondaatje and start Lawrence Hill’s The Book of Negroes.